Is there a way I can request a feature for V-Control Pro? Yes. Go to the feature request thread on the user’s forum, located HERE Neyrinck’s staff is monitoring the feature request posts to get customer feedback for upcoming versions, and also respond with feedback on the assorted requests. Does V-Control Pro have a User’s Manual where I can read about the finer details of the product and how it works with different DAWs? In contrast to many competing Control Surface Apps, we take thorough documentation very seriously and know that many of you expect real documentation in a professional product. Can I use multiple Devices simultaneously with V-Control Pro? With a V-Control Pro Bundle License, users can setup multiple devices based on the D.A.W. For instance, Pro Tools allows up to 4 devices to be setup through it's setup so 4 different devices can be used simultaneously in Pro Tools through V-Control Pro. How do I download V-Control Pro? My V-Control Pro Bundle License has expired after a month, what is going on? As it stands, the yearly V-Control Pro Bundle license requires a refresh once a month to remain active. If your license is on an ilok, please insert it into a computer that has an internet connection. If you do not see a change, please also do a resync/repair on the ilok. If you are still having issue. Please contact our support. Can V-Control Pro connect to multiple DAWs at the same time? As it stands, V-Control Pro can only connect to one DAW at a time. If you would like to use a different DAW, you must quit the first DAW and then launch the second you wish to control. Is there an upgrade to V-Control Pro for version 1(Legacy) users? As it stands, we are not able to offer an upgrade path to V-Control Pro 2 for V-Control Pro version 1 users. V-Control Pro 1.9(Legacy) does require the V-Control Pro app instead of Ney-fi to operate, which can be downloaded and installed for free HERE. V-Control Pro 1.9(Legacy) works with all of its features and functionality without a V-Control Pro Bundle license. A V-Control Pro Bundle license is only needed if users would like to use the new features such as 16 track mode with V-Console, support for multiple devices for up to 32 tracks of control, and smartphone support. I am trying out V-Control Pro Unlicensed. What features are not available? When trying out V-Control Pro without a license, the controls are restricted to fader and simple transport controls. You are only able to have one active controller at a time and it is restricted to 8 channel mode as well. If you switch to the 16 track mode in V-Console, it will only allow the first 8 tracks to control. With V-Window, you are able to view the windows, but can not interact with simple touch control. Please note that V-Control Pro 1.9(Legacy) is still fully functional without a V-Control Pro Bundle license. Originally V-Control Pro was an iPad app that connected to your DAW via the Ney-Fi software. This legacy version app is now called V-Control Pro 1.9 and is still compatible with the latest version of V-Control Pro Software. Ney-Fi has been replace by V-Control Pro Software. V-Control Pro 2 system replaced this legacy iPad app in 2015. The package included V-Control Pro Software that is installed on your main media computer and connects your DAW to the free V-Console and V-Panner Apps. This system included support for iOS and Android smartphones and tablets as well as laptop web browsers. V-Control Pro Software, V-Console App, V-Panner App and V-PlugIn App. I have a 1st generation iPad. Can I use the V-Control Pro Bundle apps? As it stands, 1st generation iPads are not compatible with V-Control Pro Bundle. The controller app V-Console that is used to connect to V-Control Pro is now a native iOS app for iPad users that requires at least iOS 7. V-Control Pro is crashing on my Mac when I use it. Do you know why? Please check System Preferences->Sharing->Computer Name. It can not be blank. If it is blank, set it to a name such as MyMac. Some users have reported that when using eyoControl on their Mac, that it can cause V-Control Pro to crash or not behave stable. At this time we suggest you do not use eyoControl when using V-Control Pro. What is the earliest Mac OSX that is supported by the V-Control Pro? As it stands, Mac OSX 10.6 is the earliest version that is compatible with the V-Control Pro. What is the latency using V-Control Pro? The latency depends upon the performance of your WiFi network. WiFi is a shared system so other computers and WiFi networks can degrade performance. Many customers using V-Control Pro have told us that they are very impressed by the performance. For the lowest possible latency, we recommend you use a computer-to-computer WiFi network (ad hoc network). Alternatively, if your computer is connected by Ethernet to a WiFi router, that can help achieve low latency also. However, if both your computer and iPad talk over WiFi to a WiFi router, then latency increases because a network message has to hop from the iPad to WiFi router over WiFi, and then from WiFi router to computer over WiFi again. NOTE: Using the direct wired connection would be the lowest latency possible. There are some issues connecting to the DAW on Windows with V-Control Pro. When running V-Control Pro on Windows, it is best to launch both the DAW and V-Control Pro app in Administrator Mode. To do this, right click on the App's icon and select "Run As Administrator" when launching. This can be set by default by right-clicking on the App's icon and selecting "Properties". Click on the "Compatibility" tab and enable "Always Run as Administrator". The Wired connection is not working in Windows. Please Help. There are specific drivers needed so the iPad can be recognized once connected to a Windows computer with a USB cable. These drivers can be installed by installing iTunes onto the Windows machine. After installation, iTunes can be removed while the drivers remain installed on the Windows computer. (Windows) The V-Control Pro app will not see VCP 1.9/V-Console even though it says it's connected. If on Windows, and the iPad app is able to see the computer, but it will never show on the main V-Control Pro app as connected on the computer, please ensure that the network setting is not set to "Public" open, as it will not allow the iPad to be recognized. Please set to "Home" so it will allow incoming connections from other devices. Does V-Control Pro allow multi-touch control? If so what is the limit? The V-Control Pro system supports multi-touch which and is dependent on how many points of contact the device can register simultaneously. For example, the iPad can register 11 touch points at the same time so it would be 11 for the iPad. V-Window is not controlling my waves plug-ins correctly. Is there a solution? We have reports that Waves plug-ins don't control correctly when on a second monitor. Move them to the primary monitor to get correct V-Window control. I am on Windows 7/8 and the computer does not show up in V-Control Pro. In the Start Menu, right click Computer. Double click "Services & Applications". If it is disabled, please enable as it is needed for V-Control Pro to function properly. V-Control Pro has a lot of latency when I move the faders. Why is that? Please make sure Bluetooth is OFF in the iPad settings, as there are some issues in iOS where Bluetooth operation can increase the latency times with the WiFi connection. Can you recommend how I set up WiFi for low latency with V-Control Pro? We recommend a wireless-N dual band router such as the Netgear N600. Enable 5 GHz WiFi on the router and connect it to your DAW computer by Ethernet. The Ethernet cable can be very long so you can move the router to the center of your studio. We have used this configuration at trade shows and get very high performance, even with hundreds of other WiFi networks all around us. Also, you can connect with a direct wired connection instead of using WiFi if the strength is weak. How can I make sure that my Computer’s Firewall is not blocking the connection between V-Control Pro and my DAW? On a Windows system, look for the “Windows Firewall” control panel. If you have verified the computer's firewall is disabled for and V-Control Pro still does not see the computer, check your network router to make sure the ports for Bonjour are not blocked. First, check to make sure your router's firmware is up-to-date. See your router's documentation to update the firmware. V-Window is displaying garbled images. I am using a Windows computer. What is wrong? Make sure all monitor settings are set to 32-bit. When I try connecting multiple controllers, one of them stops working. Why is that? A V-Control Pro Bundle license is required to use multiple controllers. If you have already purchased a license please ensure that it is activated and placed on your host computer or an ilok. If you do not have a V-Control Pro Bundle license you can purchase one here. If I close the window on my computer that is being viewed by V-Window, it loses the image on V-Window as well. V-Window will translate the images of open active windows on the computer only. Once a window is closed, such as a plug-in window, V-Window will no longer be able to display it. For a workaround you can drag the window off screen, but keep it opened and it should appear on V-Window still. This will not work on an OSX like Mavericks and later due to the behavior Mavericks has with screen sharing. Is V-Window good for video playback for remote foley recording? No. V-Window is designed to provide responsive control of plug-ins, instruments, and other windows with buttons, knobs, and sliders controls. How does the V-Window work when entering text? Can you type in to a dialogue box with a standard onscreen keyboard? V-Window does not provide text entry. V-Window is designed primarily to let you control knobs, buttons, and sliders so you can better use the natural interface of plug-ins and instruments. The plug-in windows in Cubase do not appear in V-Window. Uncheck the "Editor Window Always On Top." V-Window will now be able to see the plug-in windows in Cubase. Will V-Control Pro work with Pro Tools X.X.X? V-Control Pro works with almost any Pro Tools system that supports the HUI protocol which has been around since Pro Tools 6. We officially support Pro Tools 7 HD/LE or later including Pro Tools 11/12. Will V-Control Pro work in harmony with Pro Tools and a Command 8 controller? Pro Tools currently operates with one MIDI controller at a time. Thus you can not use V-Control Pro to control Pro Tools while a Command 8 is enabled for control. Open the Pro Tools Peripherals dialog and select MIDI controllers. Change Type to HUI, and change MIDI input and output to V-Control Pro. Launch your device for V-Control Pro. 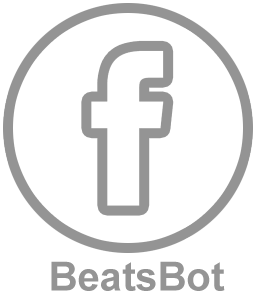 Change Type to Command 8, and change MIDI input and output to your Command 8 midi connection. How do I access memory locations using the keypad? Why does it always show stereo tracks in Pro Tools when I have mono tracks? V-Control Pro 2 uses the HUI protocol which does not indicate if a track is mono or stereo. HUI protocol provides two meters per track, we display both so that if it is a track is stereo, you will get stereo metering. After updating Pro Tools, V-Control Pro has lost some functionality. Some users have experienced issues after updating Pro Tools. One fix is to trash the Pro Tools preference files which will allow the HUI/MIDI drivers to be setup again. Will V-Control Pro work in harmony with Pro Tools and a D-Command / C24 / Pro Control? Yes, but with some limitations. Pro Tools supports using V-Control Pro simultaneous with an ethernet controller such as D-Command, C24, and Pro Control. But the two controllers are always banked to the same channels and V-Control Pro is banked to the left eight channels of the ethernet controller. Search for "Enable Metering In Second Controller" and vote to get Avid to fix this. To make V-Control Pro operate as an independent controller you can temporarily disable the ethernet controller in Pro Tools. How does the SAVE button operate with Pro Tools? When V-Control Pro is controlling Pro Tools, the SAVE button is lit if the session has changed from its currently saved state. To perform a save operation, touch the SAVE button. The SAVE button will flash when first pressed, indicating the Save process has been armed. To complete the Save process, press the SAVE switch again. To abort the Save process, touch the Escape button. I am on Windows and only get one-way communication. If you are running Pro Tools on Windows and V-Control Pro receives data but is not able to send data, please launch Pro Tools in compatible Mode for Windows 7. To do this make sure Pro Tools is completely closed first. We have found users had success when selecting "Windows 7"
I have an 003 mixer and V-Control Pro does not see the first bank. There is a compatibility issue with the 003 mixer and any other HUI control surface. V-Control Pro will not be able to see the first bank (1-8) and it will only recognize the 2nd bank (9-16) as the first. I am using Pro Tools in a Windows OS and V-Window is not functioning. For V-Window to operate with Pro Tools, the V-Control Pro app must be running in Admin Mode. Please quit the V-Control Pro app and relaunch in Admin Mode by right clicking on the V-Control Pro icon and selecting "Launch in Admin Mode". How do I Select Playlists with V-Window in Pro Tools 12? Using V-Window to change between playlists on tracks is a great feature with V-Control Pro. With Pro Tools 12 however, the necessary action needed is different than in Pro Tools 10 and previous versions. With Pro Tools 10, users can simply touch the playlist button to bring up the menu and then touch which option they would like to choose. For Pro Tools 12, users now must touch, not release, and drag to the option they would like to choose. If touching the menu button and releasing, it will simply close the menu once users touch again. V-Control Pro isn't communicating with Pro Tools in Windows. For Windows users, please ensure that you are running both the V-Control Pro app on your PC and Pro Tools in Administrative Mode. If you do not, there may be issue with V-Control Pro communicating with Pro Tools. For Users who are experiencing the “Pro Tools is unable to communicate with HUI.” warning here are some things to check for when setting up with V-Control Pro with Pro Tools. I am using Logic and when I bank or scroll it goes all the way to the left or right ends of the mixer. I can't see any tracks in between. What is happening. Please open the control surfaces setup window and change the Relative Change Mode parameter from Coarse to Full or Fine. I am using Logic 9/X and V-Control Pro does not scroll channels correctly and operates erratically. What is wrong? Do you have another controller set up in Logic->Preferences->Control Surfaces->Setup? We have seen Logic behave strangely when multiple controllers are set up. Please delete all controllers and set up V-Control Pro as the only controller. What is the earliest version of Logic that is compatible with V-Control Pro? V-Control Pro is only compatible with version 9 and X of Logic Pro and Logic Express. This is due to the fact that we interface with Logic using the very flexible “OSC” Protocol, which was only added to Logic starting with version 9. V-Control Pro crashes as soon as I open Logic. Why is that? Some users have reported this issue and it was a result to the Computer name being blank. Please go to “System Preferences/Internet & Wireless/Sharing” and type a name such as MyMac for the “Computer Name”. I am using Logic and I don't see all my tracks in V-Control Pro. Logic defaults the Channel Strip View Mode setting to Arrange and displays the Arrange window tracks on a control surface. You can place all tracks in the Arrange window. Or in the controller setup window in Logic you can set Channel Strip View Mode to All to see all tracks. To enable the environment window in Logic X, you must go into the Advanced Tools of the Logic X Preferences and enable MIDI. This will then allow you to access the Environment Window. V-Control Pro is always setup as a 24 track controller in Logic X. If V-Control Pro is installing as a 24 track controller in Logic X (VControl24) and you have the DAW Track count set to anything other than 24, check to see if you have the Raven MTi app in your Applications folder. If so, please remove it. Once removed, V-Control Pro should automatically install in Logic with the correct number of tracks as set in the V-Control Pro Preferences. Can I use multiple control surfaces on Logic Pro X in addition to V-Control Pro? Multiple controllers can be connected to Logic Pro X. Please ensure that there is only one instance of V-Control showing up in the Control Surface Setup Window of Logic however as there can be issues if multiple instances are installed. In Logic X, you must first have an event selected in the Arrange window of Logic X before pressing the 'Transform' button in the Edit/Window section of V-Console. The Sample Window does not work. In Logic X, you must first have an audio event selected in the arrange window before pressing the "Sample" button in the Edit/Window section of V-Console. This is a bug in Logic X where you can not view or edit plug-ins on Aux tracks in the V-Console plug-in editor with Logic X. Apple has been resolved in Logic X 10.4.3. Please update Logic X to 10.4.3 or later from the App Store. I am having trouble setting up with Cubase. Can you please help? You can view the Users Guide for specific setup instructions to Cubase. This can be accessed within the V-Control Pro app or by clicking HERE. Please ensure if you are using V-Control Pro 1.9(Legacy) you are using the "Cubase HUI for V-Control Pro 1 Users" for setup as it is different than setting up for use with V-Console. The plug-in windows in Cubase are not appearing in V-Window. The Cubase plug-in windows by default are a different type of window that, as of now, can not be detected by V-Window. There is a workaround available by changing the window type. Uncheck the "Plug-in Editors Always on Top"
The plug-in windows should now appear in V-Window when opened. I am having trouble setting up Studio One. Can you help? There are specific setup instructions, as well as screenshots, shown in the Studio One section of the Neyrinck support FORUM. What version of Premiere Pro do I need? You must have at least Premiere Pro CC 2014 or later to be compatible with V-Control Pro. Click HERE to view the setup video with V-Control Pro and Premiere Pro. Click HERE to view an in-depth video of using Premiere Pro with V-Control Pro and V-Console. I am having trouble setting up Premiere Pro. Can you help? Click HERE to view the setup video with V-Control Pro 2 and Premiere Pro. There are specific setup instructions, as well as screenshots, shown in the Premiere Pro section of the Neyrinck support FORUM. The Loop button does not work in V-Console for Premiere Pro CC 2015. Mackie in the Device Class and choose "Edit". Select Button Assignments and search for "cmd.audiomixer.loop"
Drag it to the "Cycle" Command. Loop should now work properly. I am having trouble setting up Reason. Can you help? There are specific setup instructions, as well as screenshots, shown in the Reason section of the Neyrinck support FORUM. I am not able to control my mixer in Reason, why is that? For using the mixer within Reason control+click/Right click on the mixer and select "Lock Mackie Controller to this device". V-Control Pro 2 will be locked to the mixer portion of Reason. I am having trouble setting up Live. Can you help? There are specific setup instructions, as well as screenshots, shown in the Live section of the Neyrinck support FORUM. How do I record arm or or solo multiple channels at the same time? In Live, by default you are only able to record arm or solo one channel at a time with V-Control Pro 2. If you solo a channel, and then solo another it will automatically un-solo the first channel. To solo or record arm multiple channels, you must use the Modifier keys which you can access in the Edit window of V-Control Pro 2. Once opened tap and hold the Control button and you will be able to record arm or solo as many channels as you would like at the same time. How do I get Ableton to play from the position I set with the Jogwheel? First, navigate to the section you would like to start at. Then, while holding the "Control" key from the 'Modifiers' in the Edit window of V-Control Pro 2, press play. It will then start at the location where you navigated the playhead to. I have recently updated and the metering is no longer working. What is wrong? The metering may be disabled in the Control Surface setup in the Utilities section after updating Sonar. After launching Sonar, go to "Utilities/Mackie Control - 1" in the menu bar. Look in the 'Options' section for the 'Meters' drop down menu. If "Off" is selected, please select "Signal LEDs + Meters". Metering should now work again between V-Console/V-Control Pro 1 and Sonar. I am having trouble setting up Sonar. Can you help? You can view the setup instructions listed HERE in our forum, or by accessing the V-Control Pro User's Guide and navigating to the Sonar section. V-Window is not working in SONAR. Can you help? If you are running SONAR in Administrator Mode and you are not able to use the simple touch control in V-Control Pro, please launch SONAR and V-Control Pro in standard mode. I am having trouble setting up MIO Console. Can you help? Is the ProControl channel matrix functional for Pro Tools? No, it is not. But we have added a new use for it to quickly select locations / markers. Press "Go To" and the select a location number 1-8. Yes, we will add more locations later. Is this for for Mac and Windows? Yes. Windows 7, 8, and 10. Mac OS 10.10 and later. Does this use a direct ethernet connection or does it require WiFi? Do not use WiFi. ProControl and Control|24 work best when the DAW computer is connected by ethernet to the same network as the surface. Consult the Avid user guides for ProControl and Control|24. WiFi is only used for our V-Console, V-Panner, and V-PlugIn apps running on phones and tablets, although they can also be connected directly using USB. Do I need to connect to the internet? How many tracks/channels are supported? Pro Tools limits HUI control surfaces to 32 hardware faders maximum. The bank and nudge buttons let you access all tracks that are in a Pro Tools session. What is the fader resolution? Pro Control provides 0.1 dB fader resolution from -20.0 dB to +12.0 dB. We have not carefully tested Control 24 yet, but I think it is similar. How does V-Control Pro work with ProControl and Control|24? V-Control Pro is an application that runs on your computer and connects control surfaces to DAWs. V-Control Pro provides virtual MIDI ports that are set up in Pro Tools as MIDI peripherals using HUI protocol. V-Control Pro connects to ProControl / Control|24 and translates them to HUI protocol. Some buttons on ProControl / Control|24 do not function because HUI does not provide every feature on those surfaces. But HUI is a good protocol and lets you do most everything you really need for professional mix control. HUI is a bad control protocol, right? No. HUI protocol is very good, but many hardware control surfaces make HUI seem bad by using 8-bit faders, and ignoring many features. V-Control Pro uses as much of HUI as possible and maps it to other surfaces as best possible. It maps very well to Pro Control and Control 24. The main limitation of HUI is that track names are four characters. Why do ProControl and Control|24 only have 4-character track names in Pro Tools? That is a HUI protocol limitation. Does it work with Pro Tools Native or just HD? All versions of Pro Tools support HUI peripherals so they all work with V-Control Pro. Is it easy to set up once and it just works or do I have to set it up every day and modify sessions? 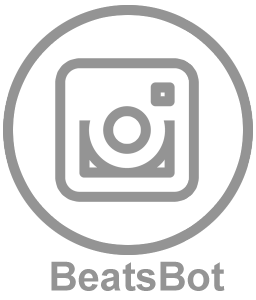 It can be set up once and will always work as long as the V-Control Pro service is running on your Mac or Windows computer before you launch the DAW. We recommend setting it up to start automatically when your computer reboots. Then it should just always work. Can this work in tandem with the Pro Tools dock? Our initial tests indicate that HUI control does work in tandem with Eucon. But we cannot guarantee that Avid will not change future versions of Pro Tools. Does the Monitor section work in ProControl and Control|24? Yes, the monitor sections are separate analog systems that operate independent of the DAW. What DAWs do ProControl and Control|24 work with through V-Control Pro? Pro Tools, Logic Pro X, Cubase and Nuendo are currently supported for use with ProControl or Control|24. V-Control Pro already supports other DAWs for the V-Console mobile app so it is very likely we can control more in the future with ProControl and Control|24. I have a Slate Digital Raven MTi/MTx. Can I use it alongside my Pro Control / Control 24 with V-Control Pro? Yes. The Raven already uses V-Control Pro so you can simply add a Pro Control or Control 24 to the list of controllers and set it up in tandem. The Raven is a 24 channel surface, so any other surfaces set up in tandem will bank 24 channels at a time. Can AVID make your software fix incompatible through their Pro Tools updates? V-Control Pro uses the HUI protocol to control Pro Tools. Many third-party products use the HUI protocol. If Avid stopped supporting HUI, it would make V-Control Pro and many other third-party control surfaces incompatible. We do not think that is likely, but we cannot guarantee it. Does this connect ProControl / Control|24 to EuCon? No. Avid does not provide a way for third-party surfaces to connect to EuCon. We have to use the HUI protocol. Can I use my entire 48-track ProControl with Pro Tools? Unfortunately, no. It will be limited to 32 hardware faders maximum. That is a limitation of Pro Tools using the HUI protocol. The bank/nudge buttons let you control all tracks in a Pro Tools project. However, you can map extra fader packs to any of the four banks for extra surfaces. Can I use the ProControl Edit Pack’s motorized joysticks? No. Unfortunately, Pro Tools does not provide surround pan position feedback. The first version will not support any Edit Pack features. Our hands are full trying to make the fader units work well. What about the Digidesign 002 series or Command 8? We have not had any time to look at the 002 or Command 8. That is an interesting idea, though. For Mac users, check the Network settings in the main Preferences settings. If the ProControl/Control|24 unit shows up as Red (Offline) in the Networks available tab, move the connection from Ethernet port 2 to Ethernet port 1. What DAWs can I use the Spill Plug-in with? As of now the Spill Plug-in is only available for Pro Tools. I am running Pro Tools 10 but the track names are not transferring to the V-PlugIn controller. There is less plug-in integration with previous versions of Pro Tools so certain data such as track name are not able to be shown. Can I install the Spill Plug-in on multiple machines? 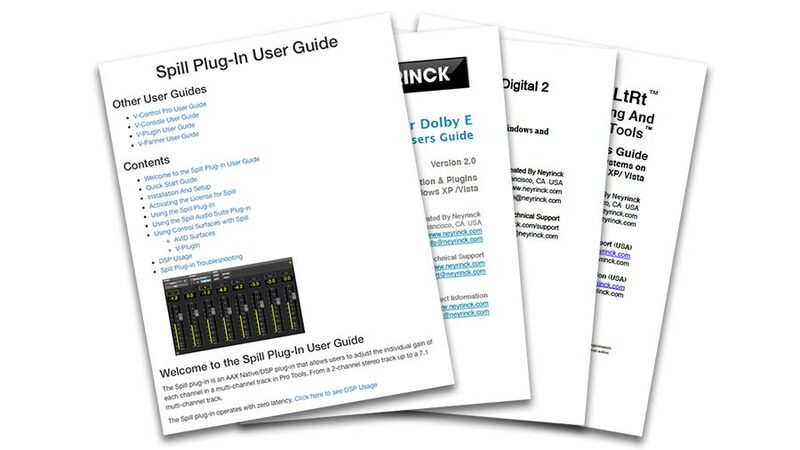 The Spill Plug-in can be installed on multiple machines, but can only be used on machines that are running with an active Spill Plug-in license on an ilok. I am a V-Control Pro Bundle License Owner. Can you help? If you purchased the V-Control Pro Bundle which previously included the Spill PlugIn you must install install version 1.0 available here (Windows users click here). You can exchange your V-Control Pro Bundle license for a Spill perpetual license by contacting Neyrinck Support. What is the oldest version of Pro Tools the Spill plug-in will run on? The Spill plug-in is an AAX plug-in so Pro Tools 10 is the earliest version that is supported. How do I upgrade from version 1.0 to 2.0? There is no charge to upgrade from version 1.0 to 2.0. Version 2.0 uses the same license as version 1.0. To upgrade, just download and install version 2.0. The download can be found HERE. When I use the AudioSuite plug-in in Pro Tools to "Decode and Import," Pro Tools presents a dialog box that says "No audio was selected." Pro Tools 8 has a bug where if it thinks you have selected no audio, it does not need to perform Audiosuite processing. It can happen if you make a zero length selection or if the the selection area has no audio regions in it. There is a simple workaround. Make a non-zero length selection and place some audio in the timeline within your selection. Is there a users guide for N-Mon? N-Mon has integrated Help that provides information on how to use N-Mon. To access the integrated Help, launch it from the /Applications folder, locate it in the menu bar at the upper right, click on it, and select the N-Mon Help menu item. A PDF version can also be downloaded HERE. Do you have some sample Dolby E encoded material I can use to play around with and check out the SoundCode functionality? We have two 5.1 + Stereo Dolby E streams you can download. One is 29.9 fps and the other is 25 fps. When I boot my OS X system, I see this error message: " N-Mon Driver not Found. Please install the N-Mon Driver." This error message probably means that the kernel is running in 64-bit mode but you are using an outdated N-Mon that is not compatible. Please update to the latest N-Mon by downloading the installer for Dolby E 2.0.7. In version 2.0.7 N-Mon was improved to operate in 64-bit kernel mode. Older versions only operated in 32-bit kernel mode. Another facility will be providing me with Dolby-E encoded WAV files created with your software for us to layback to a digital VTR. Is there anything special I need to know to lay these back? Or is it as simple as putting the WAV file on a track and sending it to the deck (with the deck on data mode), and monitoring back through my Dolby-E Decoder hardware? Are there any potential clocking issues? Because a Dolby E stream is simply stereo PCM audio, it is very simple to layback to a VTR as you would any PCM audio. But be very careful with a few things. 1. Don't listen to the raw Dolby E stream unless you have the monitor volume turned way down. Dolby E is full-code noise that can damage speakers and ears at loud levels. 2. Use AES or SDI to connect to the VTR. The connection must pass 20-bits of the PCM audio. 3. Make sure no no sample rate conversion or gain change is in the signal path. Pro Tools HD 192 interfaces, for example, have optional sample rate conversion on the inputs. Make sure it is are disabled when monitoring a Dolby E stream from a video tape. What is the largest file size your software is able to encode? I am aware of a file size limit for creating interleaved audio files in Pro Tools and was wondering if your software had this limitation as well? Pro Tools does not handle files larger than 2 GB. Neyrinck products can read and write files of any size. Can I punch in on a already encoded tape for a fix or patch or do you need to re encode the whole program again. You can punch in a re-encoded section if you follow a couple rules. First, place a marker at the start and end point to be re-encoded. Make a selection in the timeline that has at least 2 frames of pre-roll and post-roll before and after the marker points. Then encode the audio. Then import the WAV Dolby E stream and trim the beginning and end to align with the start and end markers. That's it. Now you punch in the re-encoded Dolby E stream section. My ilok has been lost/stolen/broken and I need a replacement license. If you have lost access to your ilok license for any of our SoundCode products, please submit an RMA through ilok.com. Once it has been verified and you have received an RMA number, please contact us with that number and we can deposit a brand new replacement license. I tried SoundCode for Dolby E with Final Cut but no longer have a use for it. How do I remove it so it stops asking for iLok authorization when I launch Final Cut? Can I decode eight channels simultaneous in realtime? Yes. Version 2.0 features simultaneous decoding of all Dolby E programs using the "dolby e program" control in the monitor/player. The control has nine values to choose from. The first eight let you select any of the eight possible programs. The last choice lets you select all programs. If you are using the Pro Tools plug-in, then you must use the "Mon8" type. The "Mon8" type plug-in is stereo-to-stereo but provides six additional outputs using the Pro Tools auxiliary output stems feature. To monitor all eight outputs you must create three additional stereo aux tracks and set their inputs to come from the plug-in inputs. Will your software allow pro tools to play back Dolby E files in real time, in order to be laid back to a VTR? Yes. The lightning fast encoder creates a stereo WAV file that can be laid back to a VTR using any workstation. The realtime decoder is then used to monitor and test the layback. In Pro Tools 2018 I am not able to encode in Dolby E 5.1+Stereo format. This is a bug in Pro Tools 2018 that has been addressed and reported to AVID. It is a bug on their end and will be resolved in the next Pro Tools update. When my LtRt is decoded, a lot of the music comes out the center speaker, even though the music was all in the L and R channels of the 5.1 mix. What is going on? The Center speaker in a Dolby Surround/PL1/PL2 system produces stereo imaging that is slightly different than that of a two-speaker stereo system. Most music engineers find this distracting at first, but adjust quickly. Those who mix motion picture sound feel comfortable, as do those music engineers who own a home theater system. The most noticeable difference in the stereo image is that the perceived image tends to be narrower when a Center speaker is used. Because most music mixes contain significant amounts of Center-channel information, we are used to hearing a phantom image produced by the Left and Right speakers. Since all of this information is now directed to a single point source, the Center speaker, we perceive it as being in the center. One way to correct this in the mix is to make the image slightly wider than normal for a two-channel stereo mix. Can this plug-in be used for a tape based deliverable, such as the Sony SR format? Can I record an encoded LtRt mix to tape using this plug-in, or is it only for file-based deliverables? SoundCode Stereo LtRt and SoundCode LtRt Tools work well for both tape-based and file-based deliveries. The TDM or RTAS type can be used to do a layback in real time to analog or digital video tape. The Audiosuite version can encode to a stereo file at 10-20x realtime. The file can be used as a deliverable and optionally can be laid back to tape at any time. How do I install SoundCode Stereo which is bundled with the Avid Complete Production Toolkit? The Toolkit installer is used to install SoundCode Stereo. On Windows, launch setup.exe located in the Complete Production Toolkit Installer. The installer lists a set of options to install. The last item listed is SoundCode Stereo. Make sure it is selected. And then click "Next" to install. After installation it can be found in c:\Program Files\Common Files\Digidesign\DAE\Plug-Ins. I have SoundCode Stereo LtRT. Do I need to purchase the new Soundcode LtRt Tools for our new Pro Tools 10 machine but need to continue using the Soundcode Stereo LtRt for our other 8 and 9 systems? SoundCode Stereo LtRt is a TDM and RTAS plug-in that operates on Pro Tools 10, 9, and 8. SoundCode LtRt Tools is AAX DSP and Native that only operates on Pro Tools 10 and it has a Pro Logic decoder plug-in. So, the answer depends on whether you are using a TDM, HDX, or Native system. What is the Input Channel Order control for in the Audiosuite plug-in? The Audiosuite plug-in has a control to select film or smpte ordered inputs from the timeline. It is simplest to highlight a 5.1 track and encode using film order. Pro Tools always uses film order for multichannel tracks. But some customers prefer to organize the 5.1 mix as six mono tracks ordered in SMPTE from top to bottom. In this case you can highlight all six tracks and set the control to SMPTE order. Will SoundCode LtRt Tools work on my Pro Tools 9 system? No. SoundCode LtRt Tools is an AAX plug-in and requires Pro Tools 10. If you have a TDM system and upgrade it to Pro Tools 10, then SoundCode LtRt Tools will operates as an AAX Native and Audiosuite plug-in. Will SoundCode LtRt Tools work on my Pro Tools 10 TDM system? Yes, but not as a TDM plug-in. It will operate as an AAX Native and Audiosuite plug-in. If you upgrade to AAX DSP later on, it will then operate as a DSP plug-in. What is the difference between SoundCode Stereo and SoundCode Stereo LtRt? I own the Avid Complete Production Toolkit. Can I upgrade from SoundCode Stereo to SoundCode LtRt Tools? As it stands you have to purchase the full version of SoundCode LtRt Tools as there is no available upgrade path from the CPTK SoundCode Stereo. The full version of SoundCode LtRt Tools can be purchased through our store HERE. I am trying to encode/decode an LtRt file across 6 mono tracks in Pro Tools, but it is not working correctly. Pro Tools 10 has changed its Audiosuite processing. In PT 9 and earlier you could select across 6 mono tracks and do a 5.1 downmix to stereo. Pro Tools 10 no longer will work that way. You must process the 5.1 audio in a 5.1 track. The region group feature can be used to select across multiple tracks and make a region that can be placed in a 5.1 track. There is about half a frame of latency when using the AudioSuite Encoder. This is a known bug that will be fixed. For now the workaround would be to manually drag the audio file back in slip mode after processing to line it up correctly. I am trying to run multiple instances of the decoder but I get severe distortion. At this time, only one native decoder can be used at a time. If you do have an HDX DSP system though, you can run multiple decoders. I own SoundCode Stereo LtRt. Can I use it in Pro Tools 11? Pro Tools 11 does not support RTAS/TDM plug-ins and SoundCode Stereo LtRt is not being ported to AAX. However, SoundCode Stereo LtRt owners can upgrade to SoundCode LtRt Tools which is an AAX plug-in fully compatible with Pro Tools 10 and 11. SoundCode LtRt Tools adds a Dolby Pro Logic IIx decoder for a full LtRt encode/decode system. How do I upgrade from SoundCode Stereo LtRt to SoundCode LtRt Tools? Go to the Neyrinck Store and purchase the upgrade for $399. System requirements are an existing SoundCode Stereo LtRt license on an iLok. The new license will replace the existing license. SoundCode Stereo license owners need to first upgrade to SoundCode Stereo LtRt. I own SoundCode Stereo which came with the Complete Production Toolkit. Can I use it in Pro Tools 11? Avid stopped bundling SoundCode Stereo with the Complete Production Toolkit starting in Pro Tools 10, offering their own down mixing plug-in instead. Therefore, it is not being ported to AAX. However, SoundCode Stereo owners can purchase SoundCode LtRt Tools which is an AAX plug-in fully compatible with Pro Tools 10 and 11. Are Pro Tools7 and 8 supported? Yes, Pro Tools 7 and 8 are supported. Please be aware of an Audiosuite issue in Pro Tools 8, where Pro Tools will display a dialog with the text "No audio was selected." Can I do an AC3 Dolby Digital encode within ProTools that I can than layback to HD-CAM synced to picture? Yes. The Audiosuite encoder outputs an AC3 file and/or a stereo WAV file. Either one can be imported into a Pro Tools stereo track (the AC3 has to be imported using the Dolby Digital import plug-in). This puts the data stream directly into a stereo track as PCM data. That stereo track can then be layed back to HDCAM. The RTAS decoder is an essential tool to test the layback. Just put the decoder on a stereo Aux track and play the tape in to it using an AES connection. The decoder detects any CRC errors for full assurance of a proper layback. How do I connect a DVD player to the realtime decoder? a. Determine if the DVD player has an Optical out or a SPDIF out. b. Using Pro Tools' Hardware Setup Dialog, configure the Digital Format to be Optical or SPDIF. g. Insert a stereo-to-5.1 SoundCode Dolby Digital Decoder. h. In the decoder plug-in window, set the decode mode to "Data Stream". Can I use the realtime decoder with the DVD Player built into a Mac computer? Yes you can if you are using a Mac that has an optical digital output. Most Mac Pro, Powerbook, and Mac Mini models have an optical out. You must configure DVD Player to output the Dolby Digital data stream. In DVD Player, select Preferences, set Audio Out to Digital. Pro Tools 12 Users: There is currently a bug in Pro Tools 12.5.0 that changes the way plug-ins are allocated on DSP chips. As it stands, V-Mon is not compatible with Pro Tools 12.5.0. Please update to 12.5.1 or later as AVID has resolved this issue. Can I use the D-Command/D-Control custom fader map feature with V-Mon? V-Mon works well with the custom fader map feature. You can download a plug-in map file HERE. What are the dimensions of the VMC-101 controller? The VMC-101 controller is 15 cm (H) by 11.2 cm (W). The speaker plug-in output level is -10 dB down when I set the monitor volume to my reference level. Why is that? By default, V-Mon provides 10 dB of headroom so you can increase the volume above the ref level. As long as you calibrate the speaker system at the ref level, the volume will match the volume displayed by V-Mon. You can set the headroom to be more or less in the V-Mon setup page. Be sure to calibrate the speaker system if you change the amount of headroom. I installed V-Mon 3 and need to re-install V-Mon 2. But the old installer won't install because it is an older version. What can I do? What does it mean if the Mute button on the V-Mon Controller is lit? The Mute button indicates that hardware mute is activated. It should be deactivated when being used. Will V-Mon work with Pro Tools 10/11 HD Native? No, as it stands, V-Mon requires an HDX system if on Pro Tools 10 and above or a TDM system is using Pro Tools 9 and below. When I import a converted .mov file into Pro Tools it shows "Can't Link. Can't find codec or non-supported file..."
SoundCode Exchange MXF does not provide video codecs to decode any video in MXF files. You may need to install a codec depending on what type of video codec is used in your MXF files. Which version of Quicktime should I have installed? Please ensure you have QuickTime Player 7 installed. Does SoundCode Exchange MXF work with Pro Tools 11? SoundCode Exchange MXF is fully functional with Pro Tools 11 and is available in 64-bit AAX format.